Can Anchor Rods Resist High Shear Loads? Home/Anchor Rods/Can Anchor Rods Resist High Shear Loads? During a recent technical support session a customer asked how effective the anchor rods are, as compared to shear lugs, to resist high shear loads. The obvious answer was that shear lugs are by far more effective. Rather than arguing with theories, I decided to quantify the answer by testing, using our software ASDIP STEEL. This document reports my findings. For this experiment, I selected a 18″x 18″ base plate supported on a 24″x 24″ pedestal, which are very common sizes. The column will transfer the factored loads shown below to six anchor rods embedded in the concrete. The goal is to find the shear load capacity, using the anchor rods only first, and then using a shear lug, and compare the results. The combination of vertical load and moment produces a tension of 27.1 kips in the anchor rods, as shown above. To maximize the tension capacity I added anchor reinforcement in order to avoid the tension breakout failure. The tension design ratio is 0.50, and the anchor reinforcement controls the tension design, as shown below. Find the shear capacity of the anchor rods. To maximize the shear capacity I added anchor reinforcement in order to avoid the shear breakout failure. The maximum factored shear load that this structure is able to resist is 30 kips. The shear design ratio is 0.75, and the concrete pryout failure controls the shear design. The tension-shear interaction ratio is 0.96, as shown below. It should be noted that increasing the anchor size, or the number of anchors, will not improve the shear capacity, since it is controlled by the concrete pryout resistance. Result: maximum shear load = 30 kips. Find the shear capacity using shear lug and friction. Unlike the anchor rods, the shear lug doesn’t resist any tension, therefore there’s not tension-shear interaction. 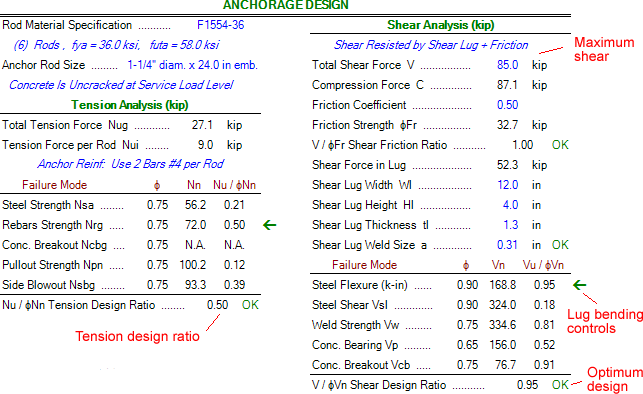 To maximize the shear capacity I found the optimal shear lug dimensions in the software. The maximum factored shear load that this structure is able to resist is 85 kips. The shear design ratio is 0.95, and the shear lug bending controls the shear design, as shown below. It should be noted that increasing the shear lug thickness will not improve the shear capacity, since the breakout resistance would then control the design. Result: maximum shear load = 85 kips. Anchor rods typically resist tension, therefore a tension-shear interaction applies. Anchor rods are closer to the concrete edge, so the breakout capacity is affected. Anchor rods shear capacity may be controlled by concrete pryout, which is related to the breakout capacity. Increasing the anchor rod sizes to resist more shear may affect the ductility of the structure in tension, since the concrete breakout will fail first. Detailed information is available about this structural engineering software by visiting ASDIP STEEL. You are invited to download a Free 15-Day Software Trial or go ahead and Place Your Order. Thank you for reporting this. I will look into this issue.